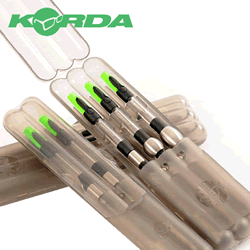 Korda Stow Case The ultimate in protection for your Stow indictors. These magnetic protective cases have been custom designed to hold your indicators securely. The heads clip into the boxes and the magnetic chain extension attaches to another magnet at the base of the box - ingenious! We have produced two-rod and three-rod versions. If you've got Stows, you'll want these cases!